The thing about afternoon turkey hunting that gives hunters fits is the lack of, or significantly reduced gobbling. Spring turkey hunters have a tendency to assume if they hear no gobbles, there are none in the area. I started regularly killing afternoon birds when I realized toms make other more subtle calls which I needed to be closer in order to hear. After I spend a morning camped out on my rear, some afternoon strolling/trolling feels good. Fortunately, a walking turkey sounds very much like a walking human, so long as the human stops, pauses, slows down and does not walk in a straight line from here to there and if the person makes turkey sounds it becomes even more naturally convincing. Old-time hunters used to call this moseying, not run and gun. Nesting turkeys prefer more open, almost park-like woodlands or edges of short grassy fields. Rarely will hens nest in brushy areas that diminish visibility. The incredible eyesight of a turkey is its number one defense. Clearly, it is not in their best interest to get into places of reduced visibility; this makes for ideal trolling conditions. Trolling for turkeys involves moseying along making turkey calls. Think of it as if you were moving along searching for a buddy calling out their name occasionally. In this case, we’re looking for a gobbler who in turn is looking for company. So the hunter should yelp (hey anyone here? ), cluck (I’m here, where are you?) purr with leaf scratch (yum this is tasty, and I’m content). Keep in mind the response may be a gobble, but more likely it will be a single course sounding yelp or cluck. Hearing the quieter turkey sound indicates, of course, the turkey is probably close by, so setup immediately and try to engage in conversation with the bird. Don’t be afraid to call, err on the side of more calling rather than less. Keep it soft and conversational matching the mood of the turkey with just a bit more urgency. Another all too common springtime afternoon situation is the gobbler or gobblers strutting in a field with disinterested hens. The gobblers are openly competing for that lady’s attention, but well guys it can be frustrating, to say the least. Like nearly every other hunter I’ve tried sneaking along an opposing edge of the field, setting up and calling to the gobblers as they get more excited with each of my calls. Only to have those disinterested hens lead them off to parts unknown. 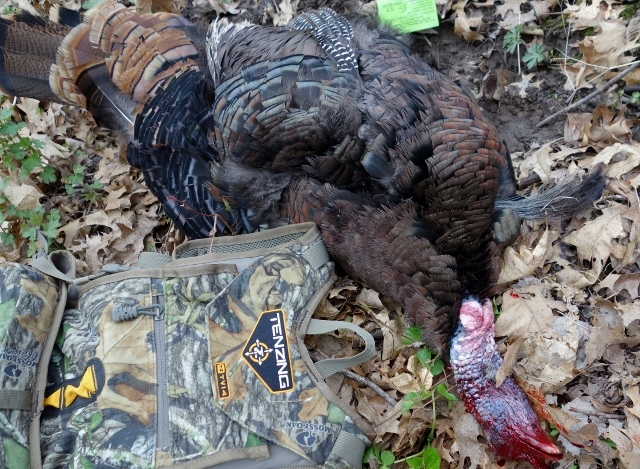 Oh, well, what’s new in turkey hunting? In this situation, I try, the edge set up and call first. Not sure why, it rarely works, it’s just that starting with the least aggressive strategy first seems to make some sense. My experiences continue to demonstrate the fall turkey hunting tactic of scattering or break up the birds usually works better. Depending on the position of the field turkeys I wait for them to get into a position that gives me a chance of separating the hens and gobblers. The goal is to get them to run or fly off in different directions. Ideally, hens one way the gobblers go in another direction. 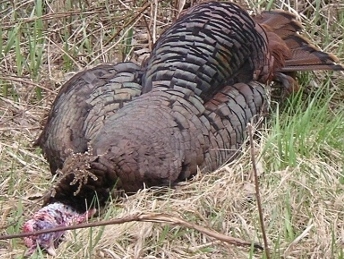 Most spring turkey hunting articles conclude when turkeys are bumped they leave the county, and the hunt is done there for the day or week, this is not true. Years of fall turkey hunting have taught me flocked up turkeys rarely move off more than 300 yards and most of the time much less than that. During my young hunter days, I would rush the flock by running, yelling and occasionally shooting just make more noise for a better scatter. Somewhere along the line a little more wisdom developed in my head, my running skills declined or a combination thereof, not sure which. Nowadays I “walk” the turkeys out of the field then setup to call the gobblers back. How walking turkeys works. The field hens are more alert to my approach so as soon as they detect me moving in, they start moving towards the cover. The strutting gobblers are distracted competing with each other and ideally don’t notice the hens moving away at first. When the gobblers are looking/facing away from the hen’s direction I then yell or whistle. Toms then start of drift out of strut peri-scoping their heads up at this point it’s time to blow the whistle again in a solid, loud blast, wave and move directly to them. Since turkeys are birds that don’t “think” more times than not they keep going the direction their body points. As soon as the birds are in the cover, I move in and setup. Wait about 20 minutes before calling. If the turkeys start calling before that time, answer back. Scattered turkeys will usually respond within about 45 minutes from the start of calling. Spring gobblers are known to respond faster because they are more vocal and driven with urgency. Keep in mind the gobblers who walked into the cover at this point are eager to reunite with the hens they abandoned.